It all started in high school. I stopped running around with my friends at recess and lunch like I did in primary/middle school and started playing chess in the library. This is also when I discovered my love for computers. Now there's nothing wrong with chess or computers, but I believe the amount of time I spent with them was what started me down the path of inactivity and weight gain. When I was working at the travel agency in Coffs I used to ride a bike to and from work most days. This probably helped prevent me putting on more weight, but my eating was preventing me from losing it. When I quit that job and started working from home, I missed all the nice lunches I used to have at the various cafes around Coffs and so started buying frozen meals for lunch at home. I was essentially having two dinner-size meals a day with little to no healthy food choices. A friend of mine then joined Jenny Craig and started telling me about the program. This is what made me realise that I could do something about my weight and not stay stuck in my unhealthy lifestyle. I figured if he could do it then I could do it. I therefore joined Jenny Craig in January 2011, weighing 115.3kg. My initial goal weight was set at 97kg. The Jenny Craig program is based around healthy eating choices as well as encouraging physical exercise. They divide food into different categories (grains, meats, fats, etc.) and you're allowed a certain number of each type of food per day based on your allocated kilojoule level (I started on 8400kJ). You meet with a Jenny Craig consultant once a week to weigh-in, check how you're progressing, and purchase your weekly food (just main meals, you still have to buy your own bread, milk, vegetables, etc.). I was initially given their 'planned' menu where all the food is pre-organised for each day into the correct amounts, but due to my fussy taste buds I was on their 'personalised' menu within weeks. I found the personalised menu much more to my liking as I could pick and choose the foods I liked while still adhering to my weekly kJ intake. I eventually settled into a routine and was progressing well. When I was nearing my goal weight of 97kg I decided to reset my goal to 80kg, as this would put me in a healthy BMI bracket. Around this same time I also dropped down a kilojoule level to 7000kJ. This was due to my new weight and activity level, and meant eating less food in general. Within a few weeks I also started on two of my own menu days. This is where, for two days a week, I didn't eat any Jenny Craig food but instead ate regular food while still trying to keep it within my allowed kJ level. This was to help me when I reached my goal weight and was weaned off Jenny Craig food altogether. For the exercise component, I knew I'd never join a gym so looked for another way to keep active during my otherwise inactive week. I came across a blog article where a guy described a treadmill desk he had built for himself. It was basically a treadmill with a shelf built over it on which he sat his keyboard and mouse, then attached a computer monitor to the wall behind it. He said that he was able to work on the computer while walking at a slow pace. I figured this would be a great way to keep active while still working (instead of sitting down all day long) and so ended up buying myself a treadmill. Dad and I built a shelf for it and I found that I could walk on it while I worked on the computer. I initially started walking at 2km/hr for 30 mins a day, but over the course of about nine months slowly worked my way up to 3km/hr for two sessions of 90 mins a day on a 4% incline. I also started going for more outdoor walks, just around the local streets. 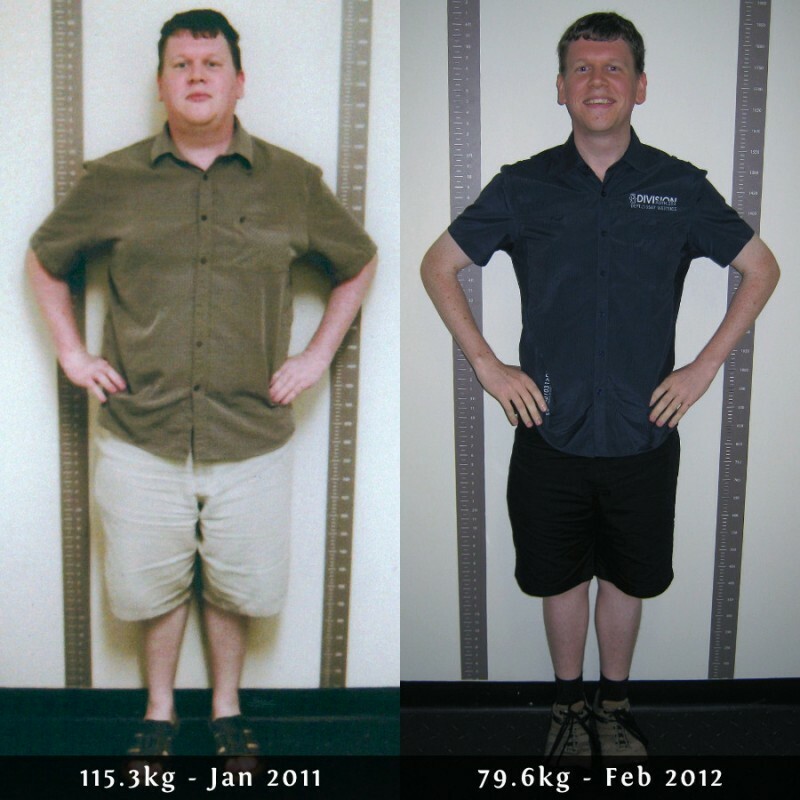 Finally, in January 2012, after almost exactly a year on the Jenny Craig program, I reached my goal weight of 80kg! I'm now 35.8kg lighter than when I started a year ago and am eating all my own foods (but still keeping within my new, higher 9500kJ level). I'll still be visiting Jenny Craig for 'checkups' but only once a month to monitor my progress. All in all it was a long journey, but well worth the effort and I'm a happier, healthier person because of it. Here are some interesting statistics about my weight loss and my time on the Jenny Craig program.